This is a superb outdoor umbrella to have for your garden parties or just relaxing in the summertime. With the 11' ft. Galtech auto tilt umbrella with LED lights, you and your guests can keep cool and comfortable during the day and enjoy romantic, twinkling lights at night. Shades are available in a variety of Sunbrella and Suncrylic fabrics, sure to coordinate beautifully with any decor. The aluminum pole features a classic Antique Bronze or Black finish and the auto tilt feature makes this umbrella simple to operate. Designed to last, this patio umbrella will retain its beauty and bold colors nicely from season to season. 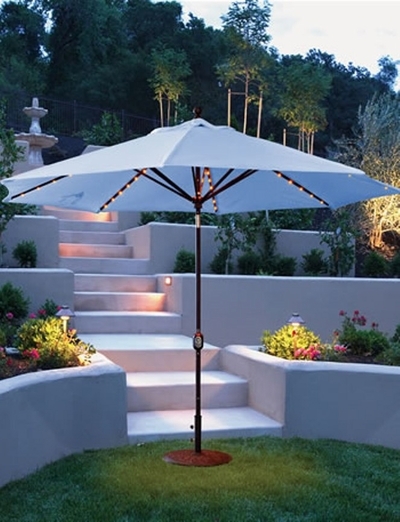 Add this gorgeous outdoor umbrella to your open-air space for the utmost in functionality, sophistication and style.